ICJA Volunteer Exchange Worldwide is pleased to welcome 20 representatives of its partner organisations from Denmark, Finland, France, Hungary, Iceland, Italy, Poland, Russia, Slovakia and the United Kingdom to Berlin from the 18th to the 22nd of February 2019. The training programme is run by the expert organization SOCIUS https://socius.de . SOCIUS has worked with hundreds of NGO’s, foundations, Universities and governmental institutions over the past 20 Years and is widely recognized as an expert in the field of organizational development and change. The training is designed for employees, co-workers and active members of participating organisations in the field of International Voluntary Service. The training sessions will constantly interrelate the values of diversity-orientation, anti-discrimination and inclusion with reflections and practical learning about change management in youth and voluntary service NGOs. The main mode of learning will be to learn about key concepts of organisational and system change, to try out practical tools and models and to reflect about their relevance for the participating organizations and other youth and voluntary service NGOs in Europe. The central questions of the training course will be: How can we make a difference given the challenge of increasing racism and discrimination against people of diverse backgrounds? Which changes are needed at a structural and operational level? How can we start reflective processes, take clear positions and display coherent behaviour? The participants will gain knowledge about key concepts and the triggering factors of possible change processes. By analysing their own organisational culture and context, they will learn how to use change management tools and models which were developed in the frame of the STAR E Project. STAR E – Standing Together against Racism in Europe! 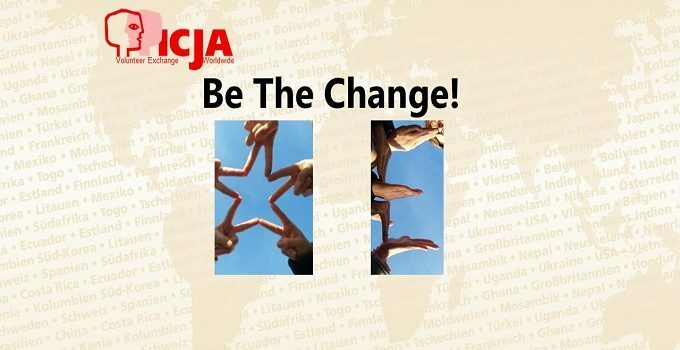 ICJA Volunteer Exchange Worldwide is an educational institution that organizes long-term volunteer services or short-term work camps for young people to raise their awareness about the effects of globalisation. The educational activities focus on topics such as peace and non-violent conflict resolution, the North-South divide and colonial continuities, discrimination, racism and xenophobia, intercultural competence and sustainability.